"In August 1985, four couples from Cornerstone Christian Fellowship in Corinth, MS, drove all night to the National Home Educators 2nd Convention in Tulsa, Oklahoma. As a group, we were all undecided whether we could or should begin to educate our children at home, but we wanted to learn more about the process. Until this time none of us had met anyone who was doing this, but we earnestly desired a Christian education for our children. We heard from various speakers such as Dr. Tim and Beverly LaHaye, Greg Harris, Dr. Brian Ray, and Dr. Raymond Moore. We talked to people who had home educated for years and stood in line to examine stacks of curriculum. All four couples prayerfully decided to home educate in the next school year and to support and encourage each other. Throughout that first year several other families were added to our roster and in the next several years quite a few more joined our group. In the first years, the majority of the families went to church together at CCF. This support group was loosely organized with our pastor's wife, Ruthie Young, as our leader. In the early years we had certain days of the month set aside for field trips, outings to nursing homes, and Creation Day when the kids would recite a poem or scripture, present an art project, cooking display or a science experiment. The mothers, also, began a Mom's Night Out to talk and fellowship. It was great therapy for mothers needing a little extra help. During the initial years most of us took "The Teaching Home" magazine, for encouragement and ideas. We needed information to keep us in touch with the birthing of a new day in modern education in America. The heart of our decision to home school our children was obedience to the Lord and the desire to see them grow in His wisdom. Deut. 6:6-7 states, 'These commandments that I give you today are to be upon your hearts. Impress them on your children. Talk about them when you sit at home and when you walk along the road, when you lie down and when you get up.' This scripture motivated each family to take responsibility for the Christian training of our children. We became convinced what we were doing was a responsibility the Lord gives all parents to oversee and direct the impressionable years of the children's lives." 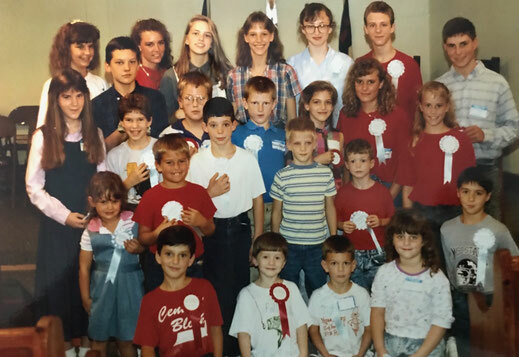 EAGLE homeschoolers pictured in red shirts with other homeschoolers from Mississippi, circa 1986 or 1987. EAGLE Home School Association and what that meant to us. We had heard the Lord speak to us. Our children need the support of each other in this new thing their parents were making them do! When we first began in 1984 it was a little frightening, as is usually the case when stepping out into something new. We started with three other families and a total of 13 children, ages 1 to 12 years old. Although our little ones were excited to stay home, the older ones approached this with great trepidation. Our 7th grader was quite unsure of 'quitting school' and knew for certain that her mom and dad could not possibly know enough to teach her all that she needed to know in high school. In our shaky faith we assured her that we would get good school books and we took the leap of faith! At that time ABeka would not sell to home schoolers, so we 'boot-legged' books through an understanding church school nearby. As we began to meet, we found that other parents 'came out of the woods' and began to join us. They, too, were hearing this new word 'home school' and were being obedient, even though it seemed a bit unusual to their kids too. One of the statements I remember from those years was, "Mom, they look like us!" In other words, "Maybe we aren't so strange after all!" After a few years, as others came on board, and we began to form relationships across the state and even the nation, we realized that our God was up to something big, and we were blessed to be a part of this new way of educating our children. The friendships formed in that first season of the EAGLE Association were and still are treasures in our hearts and lives. By the way, that 7th grader now has 4 children of her own and is homeschooling all of them. It worked!